If you want to submit a PCB scan for SNES Central, please follow these guidelines. I appreciate anyone who will take the time to add to the SNES Central collection of scans. 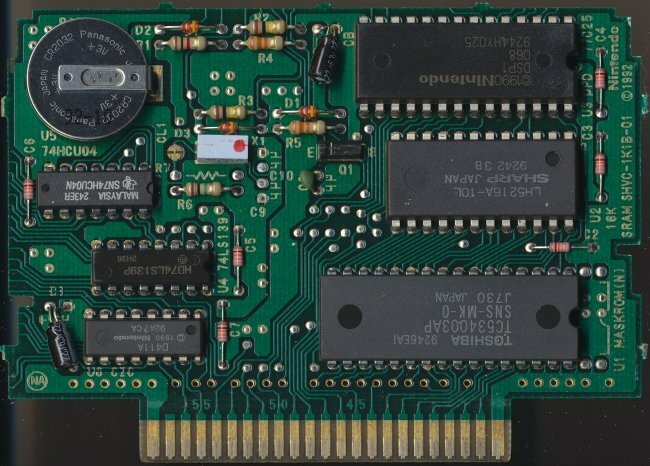 With PCB scans, we can verify ROM revisions, determine the memory mapping for accurate emulation, and find the periods when games were manufactured. In order to make it easier for me to add things to the site, please follow the guidelines below when submitting a scan. By doing this, it will cut down the amount of time I spend on scans, so that I can spend time on other aspects of preservation, such as investigating prototypes. If you are submitting scans, email me. Please note, I am specifically looking for (in order of priority) ROM revision variants, PCB type variants, coprocessor variants and manufacturing date variants. Always check the game page to see if a relevant scan already exists. Note, if the scan is good enough to read the above information, you don't need to record it. The only thing that can sometimes be problematic is if the chip has really faint writing on it, which sometimes happens with the decoder chips. The RAM size can also sometimes be hard to read if a capacitor covers it, but I can figure it out from the PCB serial code. If you have more than one PCB scan to submit, put them in separate folders, with the folder name being the game name, so I can quickly identify it. Hitachi chips have a three digit date code, Year-Month-Week (2G1 in the above scan). I found a site that has this decoded this. The first number is the last number of the year (above, 1992). The second character is the month, see the below list to find out which one. The third character is the week of that month. You can use this information, along with a site with listings of week number (example) to find the approximate four digit code that I want. In the above example, it is 9227. Ricoh RP538000G MASKROMs were used in a few games around 1994. Though there are various numbers on the chip, I could not find what the date stamp was. I suspect it is "4EB" (1994), but I don't know the rest. If anyone finds out, let me know! Samsung MASKROMs - these are fairly common and do NOT have a date stamp. Unless some other aspect of the PCB is a variant I don't have (i.e. ROM variant or PCB variant), don't bother scanning.